Atheists are sometimes accused of waging a "war on Christmas". My question is why any knowledgeable atheist would bother. Nothing about Christmas has anything to do with Jesus or Christianity. The concept of December 25 as the birthday of a god originates with the cult of Mithra (depicted above), the ancient Persian god of light and wisdom. Mithra's cult dates back to at least 1450 BC, but became much more widespread after it was absorbed by Zoroastrianism and carried all over the Middle East by the expansion of the Persian Empire under Cyrus the Great in the 6th century BC. 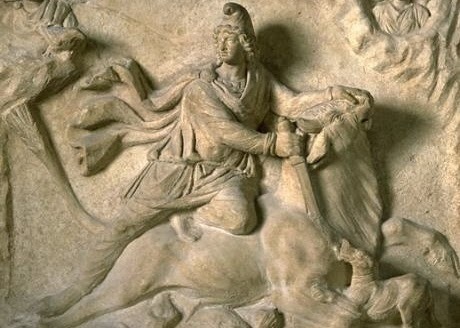 Later Mithraism became popular in the Roman Empire, with the name being Latinized as "Mithras"; the god was also known as Sol Invictus, the "Unconquered Sun". For the first few centuries of Christianity, several different dates around the year were celebrated as Jesus's birthday (the Gospels do not assign a date, though they make it fairly obvious that the birth did not happen in the winter). Eventually Mithra's established birthday was assigned to Jesus in order to Christianize the date and celebrations which were already popular throughout the Roman domain. Some parts of the ancient Persian story of Mithra's birth, such as the visiting wise men, were also assimilated into Christian mythology. The gift-giving and revelry we associate with Christmas comes from the pagan Roman festival of Saturnalia, which was celebrated from December 17 through 23. After the triumph of Christianity, these practices became associated with Christmas simply because of the proximity of the two events on the calendar. Another feature of Saturnalia was social role reversal in which, for example, slaves were seated in places of honor at meals, while their masters waited on them. I've heard that a few traces of this practice survive in Christmas today, such as a British army tradition that officers wait on enlisted men. Other trappings of modern Christmas, such as Christmas trees, the Yule log, and Santa Claus, were derived much later from Germanic paganism. Santa Claus may even be partly based on the Germanic god Odin, though the basic concept originates with the 4th-century Greek Bishop St. Nicholas of Lycia (now in Turkey), and many other strains have been woven into the character. So we're talking about an ancient Persian holiday with celebrations based on an ancient pagan Roman festival with some pagan Germanic imagery added on. There's no connection with Christianity except an arbitrary glomming on to the date as Jesus's birthday in late Roman times, which has no basis in the Gospels or in anything else. I see no reason why anyone would wage a "war" on Christmas, because there is nothing Christian about it. The other day I watched the classic film A Christmas Carol with Alastair Sim (there is a good HD version of the full movie on YouTube); it's interesting that this beloved Christmas movie contains almost no Christian references at all, and includes a conception of the afterlife completely at odds with the Christian one. A very nice summary. I'm sharing this. Ha! I just finished writing a post for tomorrow on this very subject, and the title of the post is "Jesus: The Reason for the Season? Not Quite." Most of the post echos what you have here. Anyway, since I wrote it before checking in here, I'll publish it, but I wanted you to know I wasn't stealing or borrowing your ideas. As nonbelievers, we just think alike on this subject. "Good bloggers borrow from other bloggers; great bloggers steal." Andrew: Thanks for the link. Shaw: Of course we'd describe this in similar ways. The truth is what it is. Kana: It's unusual that they're so blunt about it, but if they know the historical reality at all, what else have they got? I don't post anymore, but it is interesting how we all end up posting on this. Studies show the only part of Xmas that might have come from Christianity was the midnight mass, although it sounds pagan to me. Also, a detail in Dickens's story is that after the ghosts' visits, Scrooge sends a boy to buy a goose, because OF COURSE all the stores are open on Dec 25 in the mid-1800s, just as they would have been in Massachusetts during Puritan days. Much of "our" Xmas tradition came from Germany with Queen Victoria's Albert. Video of the day -- Russians!